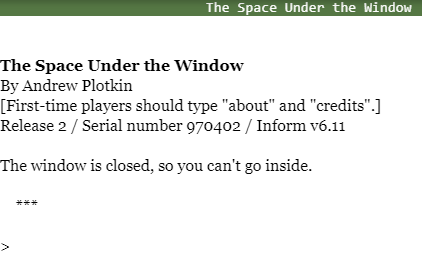 Released in 1997, Andrew Plotkin’s “The Space Under the Window” (“Space”) was a groundbreaking, unclassifiable work of interactive fiction, the impact of which is still felt today. Many consider it a work of “poetic” IF, or poetry outright, but what does that mean? Is poetry a quality of language, interaction, or both? The work itself is a bracing and uncannily “difficult” game. Although extremely short, there is density and depth, particularly in terms of point of view. Instead of using typical parser game commands, the player types in keywords presented as part of the text. This gives the piece a feeling of fits and starts which would be crippling in a longer, more traditional game but which works here as the scope is relatively small, allowing room for trial and error. “Space” has a constant sense of reinvention that was later explored in IF classics like “Aisle” by Sam Barlow. “Space” builds on this keyword exploration by making large jumps in terms of meaning and elliptical narrative. As that narrative progresses, the story of a relationship emerges. However, in a way that parser IF is especially good at, there are vast spatial disjunctions and, importantly, without any warning or cues you are suddenly elsewhere. Poetry is also good at creating these disjunctions, creating a visual marker for them with line breaks. Some have argued that “Space” would work with the same dynamic in hypertext, but I don’t think that is quite the case. In such a short piece as this, clicking a word versus typing a word creates a different semantic weight, and a different feeling of the unknown. In “Space,” it’s possible to loop back to the beginning with a keyword; or a keyword which might not work in one place does in another. There is a heightened sense of active reading and playing which is, again, very similar to poetry. One piece of context that’s important to consider when playing “Space”, and one that feels almost forgotten 21 years later, is that there are actually many, many “Spaces Under the Window” which were created at the same time. There are 27 works in total, still available online, ranging from illustrated poems, to a movie poster, to a Rubik’s Cube sculpture. What interests me most about this isn’t the individual content of each piece of the whole, but rather the community spirit with which these works were created. It’s this community conversation that is also such a big part of post-Infocom interactive fiction. And of course, Plotkin’s work straddled two communities in its release, each of which doubtless having its own reactions to the piece. This sense of community is what draws me most to thinking of “Space” as a “poetic” work of IF. Of course many works of poetry (and, okay, interactive fiction) are written in isolation, never to be seen by another human being. But for many people in many cultures, poetry is a social event—written for occasions, interspersed with riddles, and more recently shared in workshops, on subways, and in spoken word events livestreamed onto YouTube. And in the (relatively) early history of the World Wide Web with graphical browsers, this kind of collaborative promise and fun showed the promise of something old, yet at the same time unique—even if we work alone, we can still build something together. In this sense, “The Space Under the Window” is not only a game but part of a conversation. Play “The Space Under the Window” at sub-Q.